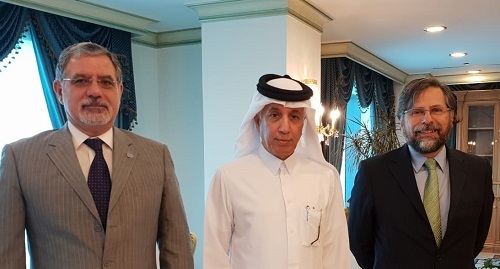 The President of the Parliamentary Assembly of the Mediterranean, Hon Pedro Roque, and the Speaker of the Shura Council of Qatar, H. E. Ahmed Bin Abdulla Bin Zaid Al-Mahmoud, explored ways to enhance and bolster relations, during a high level meeting held in Doha, on 23 January 2019. A number of issues of common interest were also reviewed. The PAM delegation also included the Secretary General, Ambassador Sergio Piazzi. This visit followed that of PAM President Rudy Salles to Doha in 2009 and a series of preliminary consultations on the margins of international events. PAM and the Shura Council also signed a Memorandum of Understanding based on the friendly relations that link Qatar with the Euro-Mediterranean region and affirming the role of parliamentary diplomacy in strengthening relations between nations and in maintaining peace and security in the world. The MoU was signed by His Excellency Mr. Ahmed Bin Abdulla Bin Zaid Al-Mahmoud, Hon. Pedro Roque. The Memorandum of Understanding provides for coordination between the Parliamentary Assembly of the Mediterranean and the Shura Council on important issues concerning the relations between them and the implementation of measures to share the views of the two sides on a number of issues, as well as cooperation between the delegations of the Shura Council and PAM at meetings, conferences and seminars. It also provides for collaboration in international fora and the exchange of experiences and best practices between the two sides. The Memorandum of Understanding, signed at the Headquarters of the Shura Council, provides also for undertaking tangible initiatives to promote peace and security in the region and in the world, for work to accomplish the goals of the United Nations, particularly those relating to sustainable development, the fight against poverty and terrorism, mass migrations and to strive for the proper implementation of the principles of international law to achieve an international community free of wars and the threat or use of force, in order for peace and security to prevail at all times. In Doha, PAM delegates also held a courtesy meeting with H.E. Soltan Saad Al-Moraikhi, Minister of State for Foreign Affairs.